I’ve had a lot of bloggers ask me about Rich Pins before. It can get a little confusing to know what they are, what they’re used for, and how to get them. Rich Pins are for Pinterest and a nifty little tool you should be adding to your Pinterest marketing strategy. Well, if you don’t use Rich Pins — you should! Enabling them on your account is actually much easier than it sounds. Plus it can make a big difference for your pins and make them much more noticeable. I’m not super tech savvy so I used to not really understand the concept of Rich Pins and how they worked. Or if I even needed them. But it’s so simple to add to your account, you can’t afford not to! I’m going to be straight with you here. It was not easy for me at first simply because I did not understand it. I combed through the Pinterest help pages and developer articles and it was honestly soooo confusing. It was frustrating. I didn’t know how people did it. I did tons of research but again, I’m not very tech savvy so I just couldn’t figure it out on my own. Until I came across a random article on the internet that explained it so easily. It just clicked. Let’s dive into what they even are in the first place. It’s not very self-explanatory and if you’re a total newbie to Pinterest, you might not even know that they exist. They are a way to add even more information to your pins. There are Rich Pins specifically for articles that give more context to pinners about your blog post. Besides the Article type, there are three other types of Rich Pins out there: Recipes, Products, and Apps. For today’s tutorial, we are going to focus on Article Rich Pins which are the right fit for bloggers! Here’s a screenshot of a pin without Rich Pins enabled and a pin that does have Rich Pins. As you can see, the left pin just has a link to the post and a description, meanwhile, the right pin has a bold title and contains a snippet of the meta description straight from the blog post! Both have the URL and the description that the pinner crafted but the pin with Rich Pins has even more details to it that might entice someone to click on it more. If you’re a blogger, you should 100% be using Rich Pins no matter what. 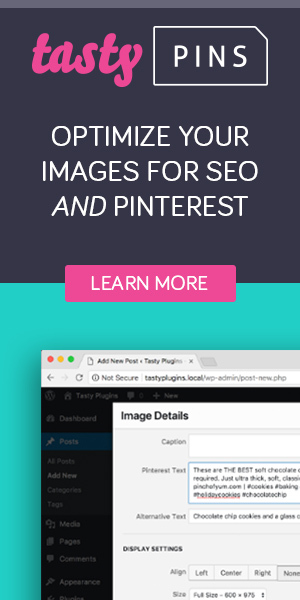 They give your pins a boost and a little extra something to get people to click on them more. In short, they make your pins stand out from a crowd. They help your pins gain more traction, encourage clicks, saves and can really grow your traffic from Pinterest overall. So now let’s jump into how to actually set them up! In fact, you can have them set up in just a few minutes with WordPress. The Yoast SEO plugin is AMAZING. It’s a plugin for Search Engine Optimization that helps you make sure you’re writing posts that are optimized to rank on search engines like Google. It’s totally free and easy to install (just search for it under the Plugins section of WordPress). Once it’s installed & activated, you’re going to click on it from your side menu and click Social. Once you’re in Social, you will see several tabs across the top. Click Facebook and then make sure “Add Open Graph Meta Data” is enabled. Next, we’re going to validate our Rich Pins! Use this link to head over to the Pinterest Rich Pin Validator. Then, grab a link to any post on your website and pop it into the box at the bottom of this page. After you validate your Rich Pins, all you have to do is click Apply Now. Then, sit back and wait for Pinterest to approve your application! You should receive an email when everything’s all good to go. Yay! You’re all set up! One final thing to note is that this tutorial is specifically for self-hosted WordPress websites. If you use another platform to blog on like Squarespace or Blogger, check out this tutorial for Squarespace and this tutorial for Blogger or contact Pinterest support for help! And if you’re on free WordPress.com or Wix, unfortunately, you can’t use Rich Pins as of right now.